USPA NEWS - "The Making of a Dragonfly" by Mary Ethel Eckard has just been released and is receiving Great Reviews. Written with the Purpose of Speaking Life and Hope into those Struggling with Grief, Loss, Insignificance, Betrayal, and Rejection, the Book is a Journey into Discovering a God who loves, leads, provides, and guides His children. "The Making of a Dragonfly" by Mary Ethel Eckard has just been released and is receiving Great Reviews. Written with the Purpose of Speaking Life and Hope into those Struggling with Grief, Loss, Insignificance, Betrayal, and Rejection, the Book is a Journey into Discovering a God who loves, leads, provides, and guides His children. 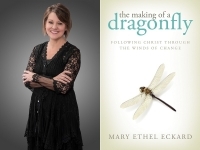 In her Book, Mary shares the Spiritual Symbolism of a Dragonfly (to reflect the Light from the Sun). Her Life Goal shifts to reflect the Light of the Son (Christ) so others will be drawn to Him. However, in the Process of being made a Reflection of Christ, Mary's lLfe heads into a Storm of Destruction where her very Foundation crumbles. In this Story, Mary shares how leaning into God brought her through the Demise of her 25-year Marriage into a Place of Joy and Purpose. God alone was her Guide and Counselor through the Heartbreak and Brokenness. She says, "To invite others to speak into my Pain only brought about Confusion and worldly Opinions. God alone would walk me through this Storm." The Book is not "just" a Self-Help Book about surviving Marital Conflict, Betrayal, and Midlife Crisis. It also includes Help for those desiring to draw nearer to God by learning to recognize His Voice. It includes Help for those struggling with Signification and Purpose and provides Direction in applying Scripture. For those seeking God, the Book contains Powerful Stories and Timeless Teachings.